One of 17 luxury residences in The Cape, an elegant private community on Cape Yamu, Villa Sawarin is a large and lavish retreat. The villa’s eight bedrooms and gorgeous living areas are spread over three levels and acres of landscaped gardens leading down to the beach. Views across Phang Nga Bay are breathtaking, especially when the sea and sky are bathed in golden light at sunrise. 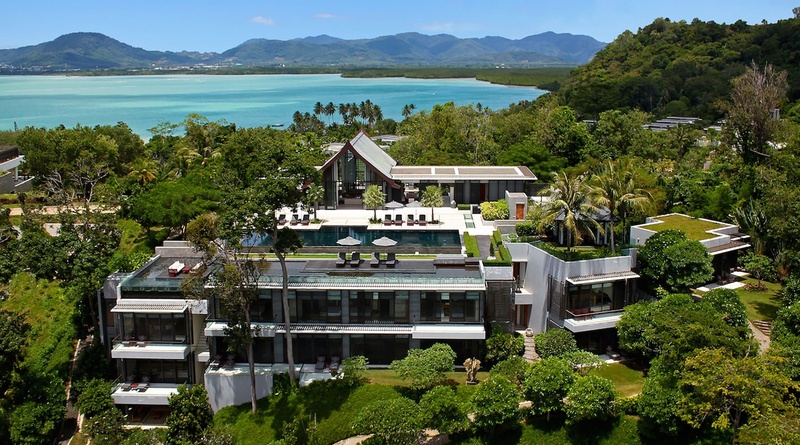 Groups and families will relish Villa Sawarin’s extensive facilities, which include a gym, games and media room, dining room with guest kitchen, spa, putting green and boathouse with a yoga deck, kayaks and stand-up paddleboards. Reflecting its location on the doorstep of Phuket’s marine delights, Sawarin’s beauty and tranquillity are enhanced by carefully designed water features throughout. Along with its dreamy 24-metre lava-rock swimming pool are reflecting pools and a waterfall wall. Thoughtful and generous design extends throughout the villa, conceived by an acclaimed design team that includes Philippe Starck and architect Jean-Michel Gathy – best known for his iconic Aman resort designs. Sawarin’s style is contemporary and deceptively simple with calming tones and no superfluous adornments. The villa’s drama and dazzle come from effective use of space and light, best showcased by its vaulted-roof entrance hall with floor-to-ceiling metal panels of intricate design and its glass-fronted exterior that glitters in the morning sunlight. The collection of art, including Thai temple spire pieces rising from the waterfall pool and large bronze sculptures, make bold statements without distraction. Interior walls are mostly unadorned, allowing their beautiful textures to shine through. Service is also generous here with a full-time, friendly team of staff including a talented Thai chef and a manager who will assist with all aspects of your stay within the villa and beyond. Villa Sawarin guests also enjoy access to facilities within The Cape estate, including a tennis court, kids club, fitness centre and the private beach club of Point Yamu by COMO resort at a nominal fee. Whether you’re seeking a restorative holiday retreat or an opulent venue to celebrate with friends and family, Villa Sawarin is the ultimate destination.